We were approached by a client to help create a ChildCareCRM HubSpot Integration which could funnel their leads from HubSpot directly into the ChildCareCRM in real time! The ChildCareCRM software is designed for today’s childcare professional and makes enrolment, billing, and scheduling easy. When combined with HubSpot’s Inbound Marketing platform, it makes for a very powerful combination. 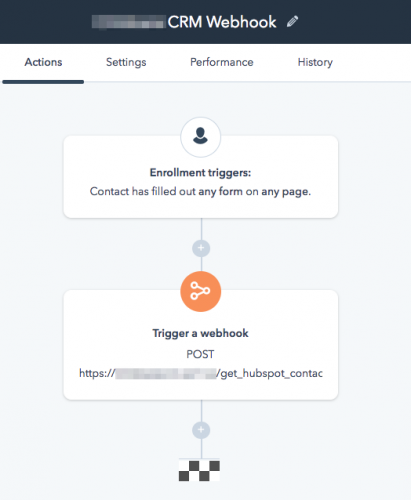 This integration was very straight forward to setup thanks to HubSpot’s webhooks! What’s the heck is a Webhook? One word, Pirates 🏴‍☠️🏴‍☠️🏴‍☠️! Just kidding… A Webhook allows you to send all the contact data from a particular system (in this case HubSpot) directly to another website URL. So basically hook into your data and send your data off to another website. HubSpot makes this really easy to setup as you can trigger one of these Webhooks directly from a Workflow. No complex OAuth2 authentication or API development is required so it becomes a very cost effective solution to setup as there is much less development time and testing involved. In the example below you can see that when a user completes a form, their data is posted off to the URL. That’s it! The great thing is that you can decide when to fire the Webhook. For example, if you only wanted to send the data when a lead score has reached a particular threshold, or if a lead is converted into an opportunity, etc. Now, you’re probably looking at the screenshot above going “sounds great but how do I setup the link to receive and process the data?” Well… this is the tricky bit. You need to create a script that lives on another web server that can receive the data and do something fancy with it. The reason being most other CRM’s or databases have their own data structure and naming conventions that they have to adhere to. 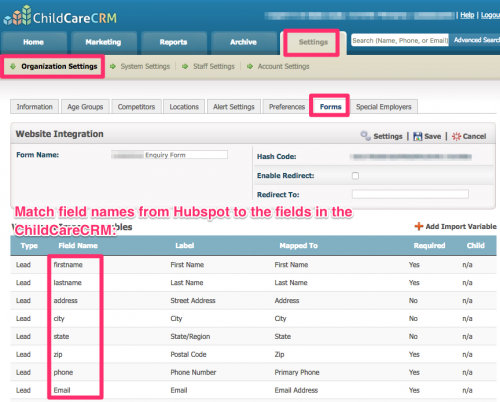 For example, the field “firstname” in HubSpot might be called “fname” in ChildCareCRM. So we would need to match those fields up before passing the data onto ChildCareCRM. Another tip is to ensure that field names with predefined options like select lists and checkboxes, match the same variables in the remote system. If this cannot be done, the script will need to convert these values over so that the remote system can accept the data. Ie. If you have a drop-down list for States, ensure that “NSW” is the same format in both systems. Otherwise your poor developer will need to clock up a few extra hours to convert them over. It also makes it a pain to maintain as if you add an extra State you would need to engage your developer again to adjust the conversion in the script. Once you have all your data matched up and good to go you simply have to CURL POST it (or similar) to send the data to the ChildCareCRM. And you’re done! Time to kick back with a cocktail and bask in the glory of all your spectacular leads flowing into the CRM! Doing something similar? We can use HubSpot Webhooks to feed data into pretty much any system. Get in touch.